On a typical night of the year, stargazers might see about 10 "sporadic" fireballs, created by fragments of asteroids or comets that burn up in the Earth's atmosphere. But that number spikes by 10 to 30 percent during the spring. The fireballs come from the asteroid belt, but their exact source remains unknown. 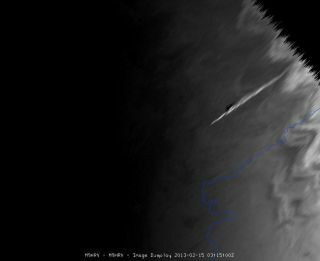 Meteor enthusiasts have known about the "Fireballs of February" since the 1960s and 70s, when amateur astronomers noticed many more bright, sound-producing streaks than usual. Follow-up studies during the 1980s failed to show any increase in the rate of fireballs, but a 1990 study suggested otherwise. Astronomer Ian Holliday studied photographic records of roughly a thousand fireballs from the 1970s and 80s, finding what looked like a fireball stream crossing Earth's orbit during February, late summer and fall. Halliday's results are somewhat controversial, but the phenomenon appears real. The February fireball increase is somewhat puzzling because the number of ordinary meteors normally peaks during autumn in the Northern Hemisphere, according to researchers at NASA's Meteoroid Environment Center. The two most visible meteor showers most years, the Perseid meteor shower and the Leonid meteor shower, peak in mid-August and mid-November. Scientists are probing the mystery of the spring surge in fireballs using NASA's All-Sky Fireball Network, a slew of cameras designed to observe meteors brighter than the planet Venus. The data collected could reveal where these fireballs come from, scientists say. Modeling the meteoroid environment will also benefit spacecraft designers.